Whilst a foundation is my base of choice, I understand the appeal & popularity of BB Creams and have recently been putting a few to the test. BB Creams are one of the big beauty trends of the last few years and today, I wanted to share my thoughts on Clinique Age Defense BB Cream SPF30. Clinique describe Age Defense BB Cream SPF30 as a medium, buildable coverage cream that reduces the appearance of fine lines and wrinkles, helps conceal imperfections & enhances skin's complexion. They state that the formula calms skin & helps protect against UV and environmental damage while working to help balance the skin and provides oil & shine control for all day wear. The packaging in the signature Clinique colours isn't the most exciting but the slimline tube is admittedly functional and also convenient for travel. Whilst I tend to avoid foundations with SPF owing to the risk of flash back in photography, I feel that a true BB cream should contain an SPF. The inclusion works well for me given when I'd choose to wear a BB cream- i.e. on more casual days when I want a minimal makeup look and am unlikely to be photographed and as such, I appreciated the inclusion of SPF30. That said, I have tested this for flashback & noticed that a white cast is apparent. The BB Cream is available in four shades. I opted for shade 01, which has a pink undertone & is the lightest shade, and I found it worked well on my MAC NC15 skin. In keeping with the Clinique branding, there is no fragrance. 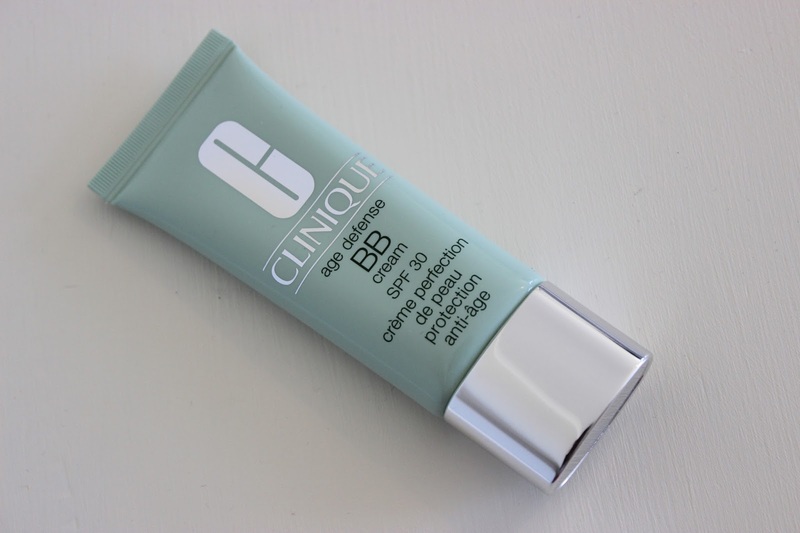 Clinique Age Defense BB Cream SPF30 has quite a thick consistency but nonetheless, I found that it applies smoothly, blends fairly well and builds to a medium coverage, thereby delivering on the claims. Skin tone was evened out & I only needed to do minimal concealing work. It left a dewy, skin like finish which looked very natural, fresh and youthful. I also tested this under foundation and found that it worked well underneath, for those who prefer a fuller coverage. My mum (who is a regular BB Cream wearer) hated this product & said that she felt as though she was putting cement on her skin because she found it heavy and as such, those with oily skin may not like this. Conversely, (as aforementioned) I tend to use foundations more than BB Creams and I personally thought that it felt quite lightweight & comfortable on my skin. In terms of the wear, I noticed some transfer throughout the day, e.g. onto my mobile after a phone call but overall, felt that it held up fairly well, bearing in mind that I don't tend to find that BB Creams have the longevity of foundations. Clinique state that the BB Cream may look a little light on initial application but that the tone will even out in 10-15 minutes. Personally, I couldn't notice any oxidisation of colour (either initially or during the day) and for me, this was a good thing. Even on my oily areas (in my T-zone), the coverage stayed in place without breaking down although I did notice some patchiness in other areas of my face after approximately 5 hours wear. Overall, I really enjoyed the usage of Clinique Age Defense BB Cream and for me, the only downside is that it causes my acne prone skin to break out, which is a real shame. For this reason, I'd be unlikely to repurchase despite really liking the BB Cream itself. However, if you don't have such issues then I'd highly recommend this and feel that it is fairly priced at £28 for 40ml.